Drum Loop, Virtual Drum/Percussion from NTS Audio. NTS Audio has released Drum Loop, an instrument aimed at DJs and producers designed to generate 100 "state of the art", "kick sidechain compressed" and "full of groovy" Dance Drum loops, and save them as wave files in one shot. It is especially suited for Minimal Techno House, Deep Tech, Techno and House, NTS says. Automate saving of 100 loops a time in less than 2 minutes, according to NTS. The instrument can be played live and has MIDI recognition on every knob for assignment to an external MIDI controller. It comes with an internal library of 250 Kicks, 1400 Hats, 1300 Snares/Claps and 1000 Percussive sounds. Sample Start and Sample End for all base sounds (kick-snare-clap-hat) permit, for example, easy creation of "state of the art" drum kicks. 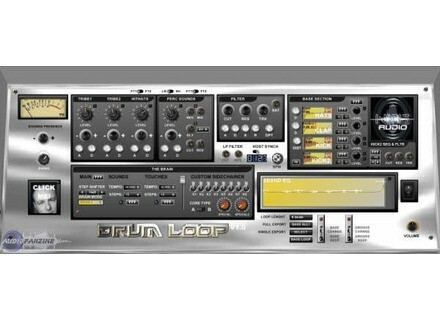 Priced at €99, Drum Loop is available for Windows (stand-alone and VST instrument). Pro Guitar Method Pro Speed Picking Pro Guitar Method has released their newest product devoted to improving guitar players' picking speeds. SKnote Q796 SKnote has announced Q796, the first plug-in in a new series of plug-ins modeled on classic hardware devices. HighLife Shareware Discontinued DiscoDSP has announced that the shareware version of HighLife has been discontinued and that the Freeware Open Source version is the only release available from now on.